When we decided to get into the campground business, we diligently researched camping news and happenings. One of the interesting things we read about was pack goats. The National Parks use them for trail maintained. There are a whole group of people who like to go hiking with their goats. The goats carry gear and pick safe trails...cool! So we decided to run a classified ad in Hobby Farm magazine. Meanwhile the oil spill happened in the Gulf. We have 54 sites to mow, I was out mowing and thinking about how sad it is that people come camping to enjoy nature but little do they know how much gasoline is used in keeping that natural, yet a park look. And then the mower broke down. Then the second mower broke down. And then the dang weedeater is impossible to load. And I remembered that in Seattle there was a company that mowed grass and cleared lots with goats (it was a link from one of the pack goat stories). It wasn't long before I was pretty set on getting my own pack goat to mow and clear trails. 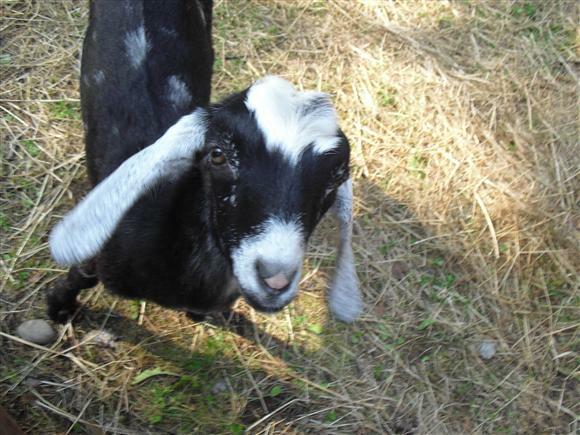 The husband had always wanted a goat and had researched the breeds and had his heart set on some Nigerian dwarf goats. He was thinking yummy goat cheese. Anyway we live IN THE MIDDLE OF NOWHERE, so when it came down to it, there was only one goat breeder in the area. Heck, she didn't even know what kind of goats she had. She thinks they are nubians or boers. She runs a bakery and the goats are a side business. She'd never heard of pack goats. Anyway, the husband and the munchkins rode out to her place and found out she makes the best cinnamon rolls (and a bunch of other yummy treats) and she had some cute goat kids that she was willing to sell us. So the husband left her farm and went straight to the hardware store and bought fencing materials, came back and built a fence. All in one day. The next day we had no new campers scheduled to arrive, so I went and got the goats (and some more baked goodies). Since we don't have a livestock trailer, we got one kid at a time in our largest dog carrier. The ride home with the first goat, I thought I'd gone insane. The maaaaawing was nonstop. I was thinking, who would go on vacation with one of these!!! Pack goats, another urban myth. We got it into the fence and the mawing didn't stop. Meanwhile, unexpected campers show up. I'm thinking they will demand a refund with all this mawing; my whole business is about to be ruined by this loud beast. Luckily the campers were cool. Goats, how funny, attitude. So I go get the second goat. The husband swears that if I get the second goat that because they are pack animals the first one will calm down. The second goat had horns so I was a little leery of the drive with him, what if he used those horns and destroyed the plastic dog carrier? The second goat was quite a bit stronger than the first goat and took the baker and her husband to shove it into the carrier. It thrashed around and mawed for a bit, but actually settled down for most of the ride. Back at camp, we pull up and the goats see each other and are truly happy to be together. They are just kids and so cute! But they wanted nothing to do with us or our kids. Princess was so distraught; she really wanted to befriend the goats. She named the brown one Whiskey. She was going to name it Jack and Teenager said if she named it Jack, the middle name should be Daniels. I laughed and Princess said, what's so funny. I explained that Jack Daniels was a brand of whiskey, and Princess pipes up that whiskey starts with W, and her name starts with W (Princess is just a blog name) and she wanted to name the goat Whiskey so they would match. 5-year-old logic, how can you argue with that! Teenager named the black and white one Shenma, it means "what" in Chinese. Shenma, wears a perpetual look of confusion or huh, so it’s a great name. So the next morning after the campers left, I was eager to get those goats mowing. Princess was dying to befriend her goats. We get into their pen and they are running around like crazy. But we get collars on them and try to take them for a walk. Walking wasn't bad; they are pretty strong and run actually. We go down to a campsite with lots of grass. The goats are pretty high strung about the collars and they kept slipping out of them. It was very exhausting to try to contain them. They had no interest in the nice green grass. Their goal was escape from the collar and humans. I had Whiskey, with the horns the collar seemed to stay put. But Whiskey was pretty strong and smart. He put his head down and wrangled out of the collar and I couldn't catch him. So husband handed me the leash for Shenma and went to chase Whiskey. Well Shenma freaked out. His buddy was running away. He like did a backflip rodeo move and escaped from me. So husband is chasing one goat somewhere where I can't see him and now goat #2 is loose. So I send Princess back to the house to get Teenager to help me. Little Guy was not with the program and not at all interested in goats or their capture. The water spigot at the campsites is no end of fascination for him. Teenager comes down in flip-flops. And we are chasing the goat. Shenma is basically circling. Riversite 1-3. Then it was 3-6. And then he decided he had enough of this and was going home. Well, Whiskey was very clever and ran to the river and SWAM across the rapids. Well, Shenma is stupid. It ran to look for its friend, but quickly gave up and decided to go back to the pen. But it was so stupid (and fast). I was chasing it with Indigo and Wisteria, it ran up the hill and looked at the road leading to its pen and turned the wrong way! Stupid thing ran into the campground. So I was chasing it-the campground road is in a circle so I figured I would follow it around the circle and herd it into the pen. By this time husband was chasing it too. The poor goat was so scared (and stupid) it ran onto an ATV trail that was really muddy and covered with blackberry bushes. We couldn't follow the same path, but the trail led to the woods and we went to the woods. We walked through the woods and came out at the river, AND THE OTHER GOAT WAS ON THE OTHERSIDE OF THE RIVER, about 1 mile upstream from where it had crossed! It was "maaaing" at us. We had just had a bunch of rain so the river was high and the current was strong. Husband and Teenager swam across anyway. But the other side was really woody and they couldn't catch the goat and it was too scared to get back into the river. So they swam back. 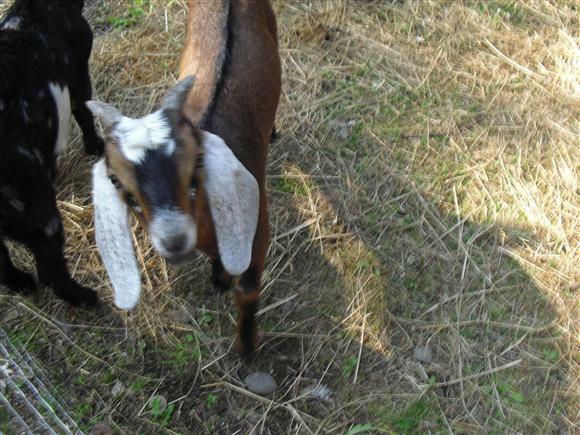 We had told Princess that the goat with horns was hers, and so she was just devasted when her Daddy couldn't rescue it. We had no signs of the other goat and lots of work to do at the campground. So everyday, for 5 days I looked for the goat in the woods. I would walk the trail and try to follow the tracks. I could hear a goat but never could see one. So one the 6th day, the former owner of the goats brought her husband to the campground to help us look for the goats. It turns out that the husband was mean and crazy. He yelled at Teenager and scared a bunch of the campers. Course they didn't find the goats. I was worried that they would keep coming back and it would be very bad for business. But the campers were really understanding. One of the campers said she saw the goat on the other side of the river. So we called and outfitter and had a canoe delivered. We canoed over, but it was getting dark and we could hear the goat, but not see it. The next day was our wedding anniversary, so we woke up early and canoed over again. We had Little Guy and Princess in the canoe with one goat cage. As we canoed up stream about 3 miles, we spotted Shenma under a root ball of a huge tree that was overhanging the river on the same side of the river as the campground. So we rowed back across and got him. He was so happy to see us. Then we spotted the Whiskey on the other side. We decided that we should check it out and maybe try to get it later. Neither Princess or Little Guy can swim, but they were in lifejackets. Now Shenma was in the canoe and in the cage, but it kept rocking the boat. I was so afraid we would tip over and the lifejackets would get tangled in the cage and the kids would drown. But Husband really wanted Princess to stop being sad about her goat, so we rowed over. Whiskey was so happy to see us that it practically jumped in the canoe. But I knew that goat was very strong and that if it was scared it might jump out of the boat and that would be awful. So Husband and I traded places. I had not canoed in about 20 years. Husband held the goat in his lap and Princess held the cage with the other goat and Little Guy did nothing, AND I had to paddle everyone across the river very quickly to avoid the rapids. It was so crazy! But I did it! So we have the goats back, but now they are so afraid that they will be lost that they refuse to leave pen and mow. Everyday I drag them out, but they just eat a little and then run back to the pen. So we are using the same amount of gas...so much for trying to be environmentally friendly!